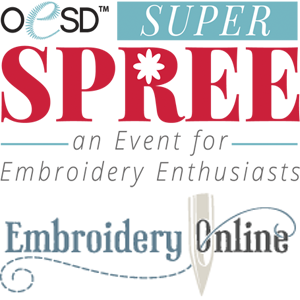 Creative Sewing Center of San Antonio is now part of AllBrands.com! Class fee $45.00 minimum 3 students YOU NEED TO HAVE AN ACTIVE CANVAS WORKSPACE ACCOUNT AND IT SHOULD BE INSTALLED ON YOUR LAPTOP. Bring your laptop to class as you will be utilizing WORKSPACE. Ok now I have it...what do I do with it ??? Basic class for those of you who have one and want to learn to use it. Class fee $50.00 Fabric Kit $15 Minimum 3 students .Viva Fiesta!! Come celebrate Fiesta by creating a braided table runner with fun Fiesta themed fabrics. This simple technique uses 2 ½ strips and a focal fabric square. It’s also a great scrap buster! Supply list: Sewing machine and accessories; rotary cutter/mat; standard sewing notions; thread; walking foot (optional). Class fee $45.00 You will need to bring your lap top pre-loaded with the workspace app. Class fee is $30.00 This is a 6 month long block of the month class. After the first month as long as you bring your finished block in...it's free. If you don't bring in your finished block you pay $5.00. This is a demonstration. Kits will be provided. If you want to learn to quilt this is the way to do it. It will be held the 4th Saturday of the month. The first class is "May Blossoms" The kit is 34.99 + tax. Class is held the 4th Saturday of the month after the Begin to Quilt class. There may be occasional changes in the date based on major events. class fee $45.00 Teacher Rosemary Castillo-Sartin Sign up to learn the basics to BES4 Lettering Software. An overview of the basic features will be covered. Supplies: Laptop with BES4 installed and updated, notepad and pen or pencil.